Very nearly looked at that one. Very glad I didn't now! Not sure if episode 13 has finished filming. If not assassinate her so Rory won't die again! DO IT FOR RORY! If this thread has taught me anything it's that there is such a thing as far too much speculation. Far too much poorly thought out speculation at that. DOCTOR WHO IS SECRETLY A ROBOT UNICORN, AMY IS A PONYTA, RORY IS A LEGO HARRY POTTER AND RIVER IS MASTER CHIEF! You heard it here first guys! Not that I'm picking up on River's clothing again but isn't that the same (awesome) outfit she was wearing at the end of The Day of the Moon? So is this a River from around that time? Or does everyone in Doctor Who now just wear the same clothes? This isn't a theory. This is fact. I just called Moffat. You should be ashamed of yourself! You've crushed innocent souls for something that isn't even definite? Hmmmm. Well, I suppose we know who's getting decimated then. I know, I'm ashamed I'm sorry. I'll make an excellent troll one day. This is our task for the mid series break. 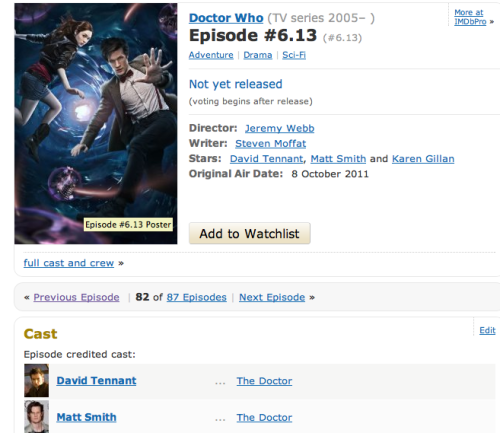 Convince Moffat to make it happen. Perhaps, perhaps, perhaps. Being a troll takes skill, apparently. It's the one she wears at the end. Why is the end-going-off-to-the-pandorica-after-finishing-adventures-in-Utah River appearing in this episode? I've never thought River and the Doctor's timelines run completely opposite. Otherwise there would be no point in syncing their diaries. There must be spikes in the line where they're on the same point or something...So maybe (due to dealing with the silence?) they go back specifically to pick up the River they just dropped off? I am prepared to learn this skilled art obi wan. I am a complete Star Wars failure, so correct me if I'm wrong.